Special promo available! If WP Engine is right for you, sign up for a prepaid annual account in May, 2015 and use promo code “POOLPARTY3” to get three months free! I have been searching for a new web host for my high-traffic podcast network running WordPress Multisite with a massive bbPress forum. I tried WP Engine for a short time and I was impressed, but could not afford to be dazzled. Make sure you read my initial thoughts on managed WordPress hosting to understand my needs and perspective. WP Engine is probably the most well-known provider for managed WordPress hosting. WP Engine's unique features are a wide range of WordPress-specialized support options (tickets, chat, and phone), easy staging sites, built-in caching and CDN, and Git push. WP Engine was easy to manage. I could create and delete my own WordPress sites, easily add redirects, and backup and restore on demand. Making a staging website took just a few clicks, and I could test new plugins or themes without breaking my public site. I loved my time on WP Engine. I used GTmetrix and Pingdom to test my sites after my migration. Every site loaded at least 20% faster than on Synthesis, and the WP Engine's CDN was amazingly fast. Because I'm also a web designer/developer, I have started learning how to use SSH for command-line operations. SSH is much faster for moving files, importing and exporting databases (especially a massive one like mine), monitoring server performance, and pushing my local Git changes to the live server (via Dandelion). But WP Engine doesn't allow SSH to any of their customers. Thus, my workflow was crippled and I would often have to wait on their support team to fix something, or slow down my workflow. Managing files over SFTP was sometimes strange. I would upload plugins, then have to reset permissions before WordPress could update the plugin. SFTP and these odd permissions would also not work well with my Dandelion workflow. I probably could have accomplished similar things with WP Engine's Git Push feature, but it was initially too complicated for me to attempt (I'm still a Git beginner). I looked at my highest-traffic days in Google Analytics and estimated that I would be near 100,000, so the $99 plan looked tempting compared to the $147 I was paying to Synthesis. I knew that WP Engine tracked the traffic differently, so I expected to pay occasional overages, but probably never more than $150 per month. 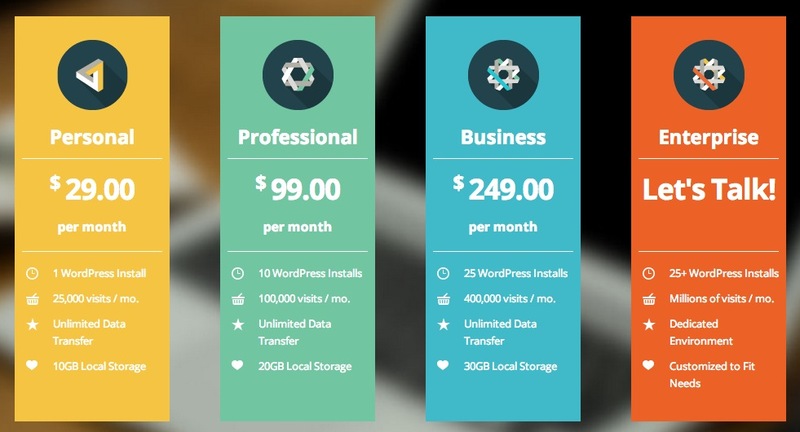 With just a one-week test, I quickly saw that WP Engine would be unaffordable. Where Google Analytics lead me to expect 3,000 visitors in a day, WP Engine would track 7,000 “visits.” It seemed that for every number I expected, WP Engine would track almost more than double. With just a week of testing, I was already about to burn up my 100,000 “monthly visits,” and it looked like my next month's bill would easily be $220 or more. Git is a pretty amazing technology for version control and development. WP Engine has this already built in, which may make some of you salivate. I never had the opportunity to try it. WP Engine also offers enterprise plans for extremely popular WordPress sites. These come at a high cost, but anyone at the enterprise level would recognize the value of a stable host with quality service and great support. Sadly, I decided I had to leave WP Engine. I absolutely loved their performance and features (except for the weird SFTP permissions problem and lack of SSH), but I couldn't justify the higher expense. After all, this whole process was inspired by a need to reduce my monthly costs while maintaining or improving my performance. Thankfully, I could get a full refund within a 60-day window, which is very generous. WP Engine is certainly a great managed WordPress hosting provider, and I do genuinely recommend them for hosting your sites. WP Engine provides great support, wonderful features, and amazing performance. Just be careful with your traffic if you're on a tight budget. In my next managed WordPress hosting review, I'll review my time with Synthesis by Copyblogger, and why I left after more than a year.